Kazakh uranium production continued on an upward trend in 2013. 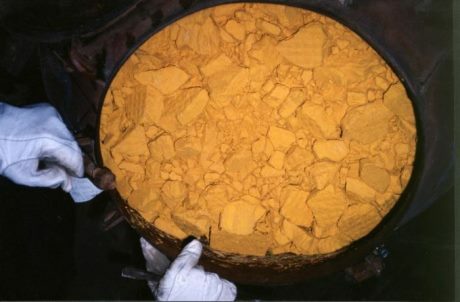 The country retained its place as the world's leading uranium producer with over 38% of global output. According to year-end figures released by national atomic company Kazatomprom, national production of 22,500 tU, up from 20,900 tU in 2012, was in line with expectations. Uranium exports for the year totalled 23,400 tU. Kazatomprom's own production came to 12,600 tU, claimed by the company to represent some 21% of total world production. Other 2013 highlights for Kazatomprom included the acquisition of a 25% share of a Russian uranium enrichment plant, the Urals Electrochemical Plant, through the Uranium Enrichment Centre (UEC) joint venture with Russian fuel company TVEL. The transaction was completed in September 2013. With over 12% of world resources, Kazakhstan has been an important source of uranium for more than 50 years. Of its 17 mine projects, five are wholly owned by Kazatomprom and 12 are joint ventures with foreign equity holders. Today, almost all of the country's uranium operations employ in situ leach (ISL) mining.